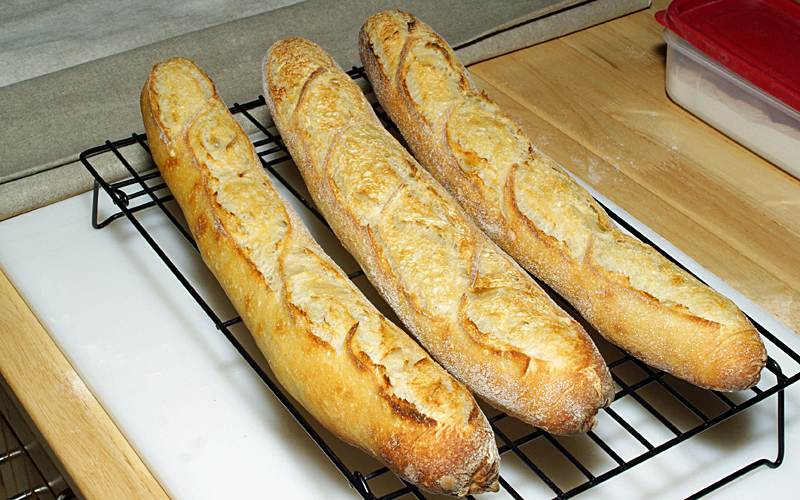 Inspired by LisaL's question Baguettes by noon? 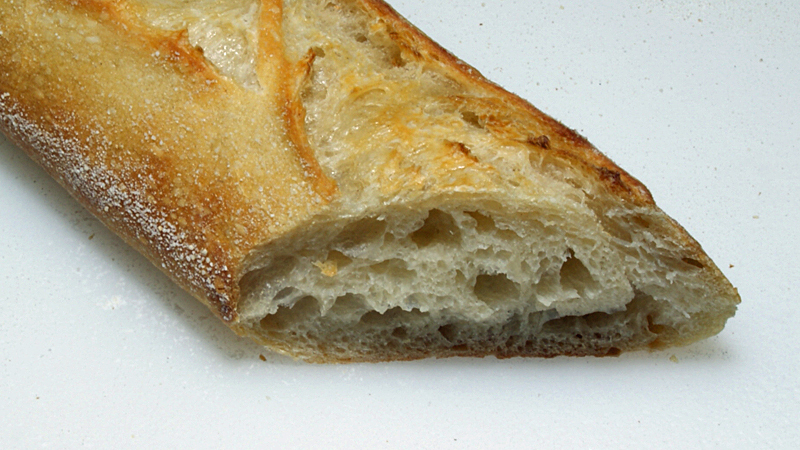 I baked a sourdough version of my overnight baguette formula for the first time. Beginning with 25g of 100% hydration seed starter I built 310g of liqud levain over a twenty four hour period, feeding 75g each of AP flour and water at the start, and the same again after twelve hours. I scheduled the build to be ready yesterday at 10am. I wanted to bulk ferment for 24 hours, at 55°F. I had an appointment this morning, otherwise I would have preshaped, this morning at 7 AM, to demonstrate I could have finished baguettes before noon: LisaL's goal. I mixed the dough (1050 g, 68% hydration, 100% AP flour) at 10:00 yesterday using ice water to immediately chill the dough, autolysed for 1 hour, and did four S&F's at 30 minute intervals. The dough was placed in the retarder--my wine closet--at 55°F immediately after mixing, and returned after each S&F. I preshaped 3, 350 g baguettes and let them rest 1 hour at room temperature (We've been having a cold spell here, the room temperature was about 67*). After restiing i shaped them, and placed them in a linen couche. I checked the dough temperature after shaping. It was a chilly 61°F. The loaves proofed for two hours, I baked them in a preheated oven (500°F), on a baking stone, reducing the oven temperature to 450°F immediately after loading with steam for the first 10 minutes. I finished the bake in another 10 minutes at 450°F with the steam source removed. I finished at 1:38 PM (including taking the first picture) . Three hours, and 23 minutes. Had I started at 7 AM I would have finished about 10:30 AM. The yeasted version of this dough usually proofs in 1 to 1-1/4 hour.